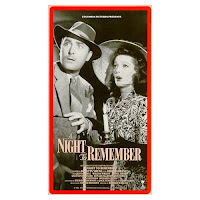 I just watched this the other day and found myself (as usual) enchanted by Brian Aherne's gift for comedy, (he wasn't too hard to look at either). 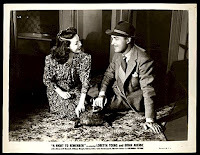 I also liked the scene when the moving man developed a paralyzing crush on Loretta Young, who was more relaxed than usual as half of the married pair, despite the farcical elements of the story. It was great fun seeing Lee Patrick and George Chandler pop up in the cast, though I did have a feeling that Sidney Toler was channeling Charlie Chan, didn't you? How astonishing to see Blanche Yurka as the housekeeper. She was such an extraordinary actress, with quite a stage résumé, it is always a jolt to see Madame De Farge from A Tale of Two Cities (1935) in such small parts. Btw, I must admit that I was mentally calculating throughout the film exactly how much that beautiful garden apartment in the Village would go for in today's inflated market! Aherne is a lot of fun -- I wish he'd had even more of a film career than he did have. I've enjoyed him in MERRILY WE LIVE (1938) and THE SWAN (1956), and just taped JUAREZ (1939). I've been collecting Lux Radio Theater shows recently -- I acquired several on LP as a teenager, and now find it's easy to get MP3 files on CDs -- and have found that he is in at least 14 so far. He had a great voice for radio. On the plane flight to England a few weeks ago I helped to set a London mood by listening to Aherne and Loretta Young in a 1946 radio production of THE BARRETTS OF WIMPOLE STREET. That scene with the moving man was quite funny -- I enjoyed seeing Young in such a giddy role. My children have watched lots of Charlie Chan movies in the last year and recognized Toler immediately. He really was a little Chan-esque in this. Recognizing each character actor's face one by one was part of the fun of watching the film. Thanks for this movie recommendation. I DVR-ed this recently on TCM and the kids and I watched it today (Labor Day). We had lots of laughs and we liked that it wasn't truly scary. I liked Brian Aherne a lot and think I'll find more of his work. As Moira Finnie commented, I was also thinking of what a grand sum could now be fetched for that lovely apartment. So glad you all enjoyed it too, Mrs. HH! Thanks so much for taking the time to let me know. I really enjoy Brian Aherne. I particularly liked him in THE SWAN (1956) -- he's a member of a royal family who has become a monk, and when he comes to visit he offers wry commentary and advice to the other members of his family. He was also fun in MERRILY WE LIVE (1938), which borrows heavily from MY MAN GODFREY. I'd like to see more of his movies too. Thanks for recommending "The Swan". It looks good and I see TCM is showing it on 10/4, so I'll be recording it.